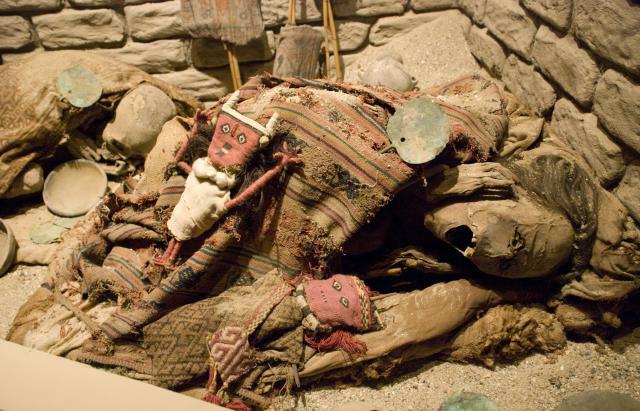 Three Peruvian mummies from the Chancay culture that inhabited the central coast of Peru from AD 1000 – 1450 are part of the Milwaukee Public Museum's collections. Buried in either a flexed or seated position and wrapped in several layers of textiles, the bodies are not actually embalmed but preserved naturally by the extreme dryness of the environment. 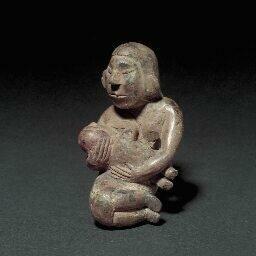 Little is known about the Chancay civilization as many of the sites were destroyed by looting or bulldozing. Two of the mummies can currently be seen in the Pre-Columbian exhibit on the 3rd floor mezzanine. This ledger book was "captured" by Captain R. Miller from Red Hawk on January 8, 1891 at Wounded Knee Creek, South Dakota, shortly after the Wounded Knee Massacre. The Milwaukee Public Museum purchased the ledger from collector H.H. Hayssen in 1897. Ledger art was a medium of Plains Indian art from the late 19th to early 20th centuries and illustrates the changes in Plains Indian life during this time. 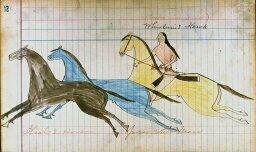 The Red Hawk ledger consists of 105 ink and crayon drawings done by Red Hawk and other Sioux men. Learn more about this collection here. Ancient burial mounds of the Hopewell culture were excavated on the Knight family farm in western Illinois. These mounds, dated to AD 150-400, contained human remains and six naturalistic ceramic figurines. These rare figures include four female individuals, two of which hold infants, one male, and one that cannot be accurately identified. It is believed that all were likely made by a single artisan. The figurines are intricately decorated and painted, revealing important details about Hopewell dress and adornment. Some scholars believe that these figurines may symbolize the importance of human and agricultural fertility, but they may also be portraits of deceased individuals. This unusual 20th century carving is one of three such known. 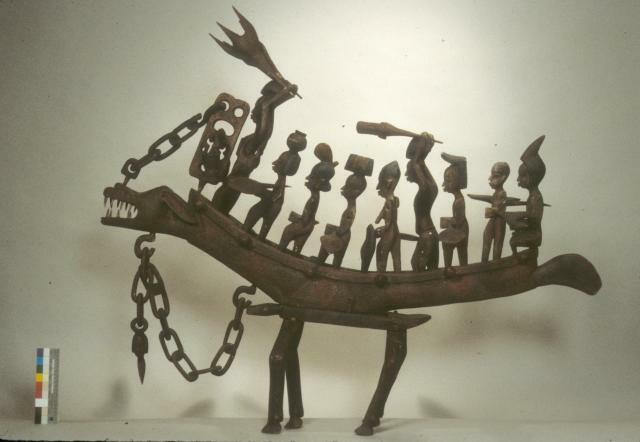 It is attributed to the Fon culture of the Benin Republic, but is most likely the creation of an Ijebu or Anago artist. These two ethnicities are Yoruba-speaking peoples living in Nigeria and Benin respectively. The meaning of this object remains as puzzling as its origins. The figures in the boat may represent members of the cult of the sea goddess Yemoja or one of her followers. Perhaps the entire composition is intended to represent the cult deities themselves in procession to some important feast. Though a mystery, this excellent composition is a tribute to the skill and creativity of African woodcarvers. This object is currently on exhibit in the 3rd floor African Hall. Two Cherokee women named Nancy A. Riley and Polly Webber are responsible for the intricate embroidery of this fringed leather coat made around 1865 for a William Gallaher of the Indian Brigade assigned to the Indian Territories. 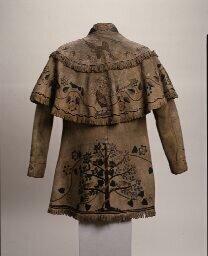 The coat was donated to the Milwaukee Public Museum by the Upham family in 1900. 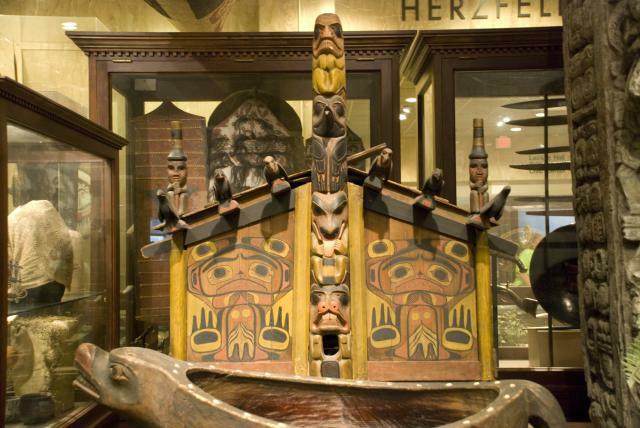 The Milwaukee Public Museum acquired the Howard collection, consisting of over 1500 items, in 1985, thanks to the generosity of Ethel Herzfeld, a devoted friend of the Museum. James Howard, a cultural anthropologist, was born in 1925 in Redfield, South Dakota. He enjoyed the respect and acceptance of Indian people acquainted with him and participated regularly in powwows throughout the Plains area. In the course of his studies he became an accomplished singer and powwow dancer and assembled a large personal collection of outfits. The collection ranges from rare, old styles already out of vogue in the 1930s to fashions current at the time of Howard's death in 1982. 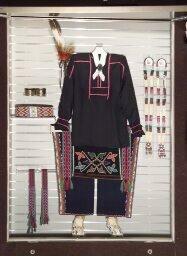 Clothing from several different tribes and regions was obtained mainly for powwows. The concentration on men's powwow dress demonstrates Howard's fascination with the more elaborate male dance outfits. This collection is one of the largest and best contemporary powwow collections in the world. What is incredibly valuable is that Howard recorded who made each item and when and where he collected them. In 1858, Mr. S.L. 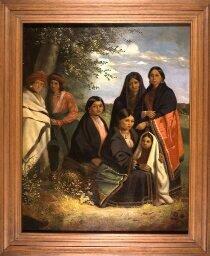 Rood commissioned Samuel M. Brookes to complete a painting of a group of Menominee men. The names of the five men are written on the back of the canvas as follows: standing left to right, Na-a-nos-a-ko-sa, and Tik-ko; seated left to right, Ne-kun-a-quak, Kis-kan-a-koem, and Na-ke-wai-mi. Aside from its value as an excellent painting, this piece is invaluable because it clearly depicts the way that these men dressed, wore their hair, and represented themselves at that time. This oil painting by Samuel M. Brookes from 1858 is the accompaniment to the painting of Menominee men from the same year. The subject matter is exceptionally rare because it is a portrait of American Indian women. It is a visual record of the ways in which these women used European goods such as textiles and glass beads, and fashioned them into their own aesthetic. The imagery also represents the gradual fading out of traditional Menominee materials due to trade. The Spencer Lake site was excavated in 1936 by W.C. McKern, Milwaukee Public Museum Curator of Anthropology at that time. The site is an ancient (AD 1100 – 1400) burial mound located near Spencer Lake in Burnett County in northwest Wisconsin. At the bottom of the mound, an intact horse skull was discovered, a startling find as it was believed that horses had gone extinct in North America around 10 million years ago and not reintroduced until the arrival of the Spanish. Two students, upon hearing of the discovery, confessed to placing the skull at the bottom of a pit they had dug into the mound, but McKern and his crew were positive that there was no disturbance of the soils around it. 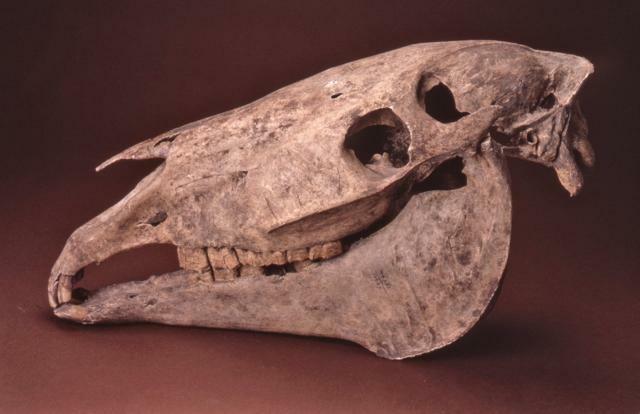 The controversy lasted until 2001 when a group studying the question of pre-Columbian horses received permission from the Museum to take a small sample of the horse skull for radiocarbon dating. It proved to be modern. This replica of the Haida Chief Skidegate's house, as well as twenty-four other house models, was first exhibited at the 1893 Chicago World's Fair. The models serve as a snapshot of the 19th century village of Skidegate on the Queen Charlotte Islands of British Columbia. As the original houses were far too large to transport, anthropologists commissioned Haida craftsmen to construct smaller and thus more mobile versions that would allow for the exhibition and study of the Haida aesthetic around the world. A legend about a little girl and her grandmother also surround this type of architecture. A bear prevented the girl and her grandmother from collecting food. One day, a beaver passed by their house and noticed the beautiful totem pole on display. He recognized the decorations on the pole as the same ones that symbolized his family, and so realized that he was related to the little girl and her grandmother. The beaver then decided to help the girl and her grandmother defeat the bear and gain back their food supply. The totem pole saved this family, the legend emphasizing the importance of having one in front of a house.